Nike have put a spin on the classics and thrown up one of the coolest range of boots you will find anywhere. The Spark Brilliance pack, lit up Euro 2016 but Nike have come out of the blocks ahead of the 2016/17 season with an absolutely brilliant new range of old school black with fantastic neon colours to really stand out. It’s the classic black boot but not as you know it! 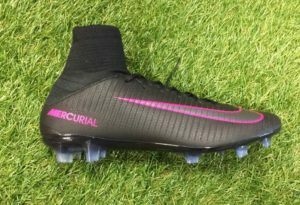 For the Nike Mercurial Superfly V, Nike have worked on a black base with pink which is used for the Swooshes, Mercurial brandings and the lower part of the studs. Also available as Nike Mercurial Vapor XI. (below). We can see these being a firm favourite with many many people this season. From the Reveal Pack to the Spark Brilliance Pack and now with the Pitch Dark Pack, the Tiempo has been the stand out in some people’s eyes and you can see why. Classic leather with fantastic jade detailing, this is one boot that will be welcomed by everyone football fan, old school or new.